“You’ve got the wrong man!” I jumped to my feet in the prisoner’s box, feeling like the wronged innocent in every Western ever made. 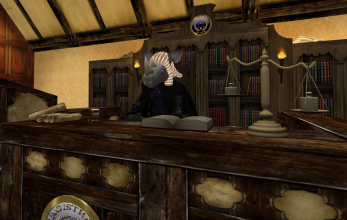 The courthouse scene was accurate in every detail, right down to the wooden gavel clutched in the judge’s fist—if you ignored that the judge was dusky purple, over two meters tall, and massed more than three Terrans. “Silence, human!” The gavel banged down and the Patril judge frowned at me, flicking his orange tongue over his fangs. The gallery, consisting of several dozen local Patrils and one lone smirking human, murmured in a deep rumble that was too low for my universal translator to pick up. The nearest Patril, a lumpy hat perched on one horn, sniggered. His bandana caught the drool nicely. Beside him, an old madam, her scarlet dress containing enough material to cover a blimp, snapped her beak in excitement. Next to her, a violet-colored Patril in a red-and-white gingham dress winked at me, her nictitating membrane catching the light. She was svelte and slender, in the way a garbage scow looks when it’s parked beside a transport ship, and I could tell she was ovulating by the sweat on her bony brow ridge. “There’s the real murderer!” I pointed dramatically across the courtroom to the only other Terran in the room—Wilmott, the mine foreman, seated complacently in the first row of the gallery. My hair brushed against my shoulders as I turned– being in stasis for eight standard years meant it was uncomfortably long. Wilmott shook his head equally dramatically, his own shoulder-length brown hair tossing back and forth. His blue eyes seared into mine. It was almost like looking into a blurry mirror, except for the sneer on his face—right down to the similar cheekbones and narrow jaw. Sheer chance, but just my luck. If humans could barely tell us apart, how could Patrils? I’d staggered off the ship yesterday, the lone passenger debarking at this station at the wrong end of the galaxy. The Long Sleep drugs had still covered me like a warm fuzzy blanket when Wilmott had greeted me by pressing the handle of a mining blaster into my hand. I’d clutched at it while my fogged mind tried to recall from the vids if that was a typical Old West welcome. Seconds later, a posse of Patrils swooped onto the landing pad, threw me over the back of a horse, and rushed me off to the county jail. Okay, it wasn’t a horse and it wasn’t a county. But a jail is a jail on any planet. As a forensic accountant, I’d seen a few jails in my time. All from the other side of the locked door—until now. I’d hardly scratched the sleep out of my hair the next day when a Patril, a star pinned to his brownish-purple hide, again threw me onto the back of the local horse-equivalent—a huge all-terrain vehicle that could fit several Terran rhinos—and hauled me down Main Street. It was my first glimpse of the little mining town, which existed only to harvest the iridium-flecked bones of Patrilia’s extinct giant reptiles. Their current fad, or trend, or—as I thought of it—godawful silly mania, meant the Patrils had named the bone dust “Gohld”. I’d only had a chance to glimpse the huge pits and sluicing equipment that dominated the hills to the east of Main Street before I was hustled off the ATV and into the courthouse. I smacked my head, trying to clear the cobwebs and focus on my trial. The judge’s tiny yellow eyes had just finished glaring at me for my outburst. Patrils never did anything quickly. “Your honor, I can prove it!” I had his attention, finally. I’d skipped all but the first this-is-your-planet vids during Long Sleep and just cherry-picked the acclimatization suggestions, settling on watching the most interesting of the old 2D, twentieth-century Western ‘movies’. By the final year of travel, I’d branched off into whodunits and thrillers. They’d sure made some good vids back then. The unfortunate deceased human, who worked in the mining office and went by the even more unfortunate name of Flunky, lay before us in an ill-fitting black suit. The label marked “Exhibit A” stuck on his forehead, combined with the charred skin at his neck, did nothing to enhance his appearance. “No, sirrah, I do not see that. I see many burn marks upon his carcass.” The judge peered nearsightedly at poor Flunky. “He was shot, need I remind you, with ‘Exhibit B’, the mining blaster. With your fingerprints on it!” He raised his gavel slowly, in sync with his brow ridge. He was about to render a verdict. 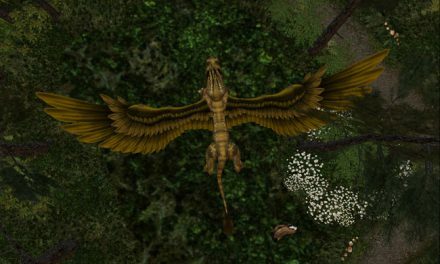 Patrils were a odd duck among the Alliance species. They latched on to a human cultural theme every few decades and converted their own reality to reflect it. Terran exobiologists called it “Patril Human Literally Executed Genre Mimicry” or PHLEGM for short. 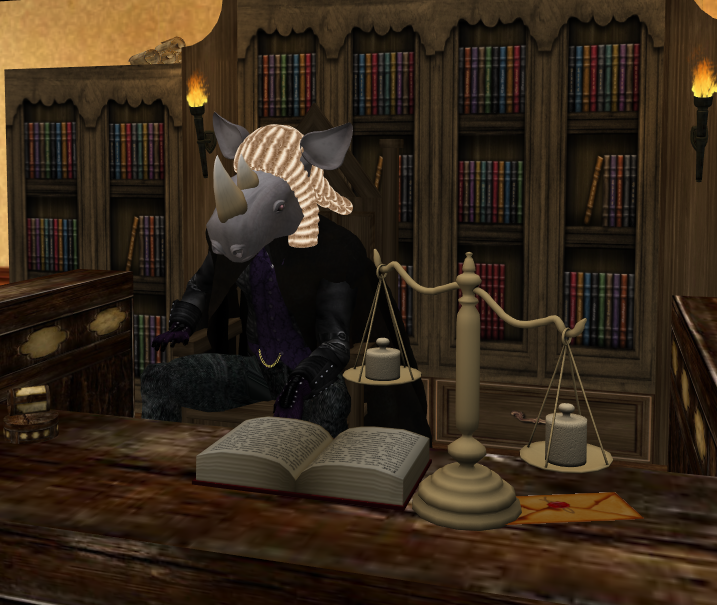 When the Terran mining company, Goodas Gohld Ltd, negotiated rights, the Patrils had insisted on a clause that Terrans must abide by the local laws, whatever they might currently be. My contract with Goodas to investigate reported embezzlement held me to that as well, which hadn’t seemed a problem at the time. A huge fee went a long way to justifying eight years of my life in Long Sleep. Flunky must have found Wilmott cooking the books. Wilmott had shot him with his own gun, one of very few on the planet, then burned him with a common mining blaster. Framing me, a similar-featured Terran, had been Wilmott’s final step. “Self-deprecating criticism is not within the Code of the West, need I remind the prisoner.” The judge curled a lip. The Code was here to stay. Until it changed, of course. “What a pack of lies. He did it. Hang him!” Wilmott’s voice rang out, echoed by his universal translator, and he jumped to his feet and waved his white hat. If this were a real western, it would have been black. Wilmott’s leather vest swung open, revealing a small handgun strapped to his waist. He started, quickly pulled his vest shut with both hands, and sat down. Wilmott looked panicked and leapt for the door. He must have more faith in proper firearm forensics testing in this backwater than I did. And in the Patrils’ reflexes. Most were still turning towards him, still in reaction to his shout. I jumped out of the prisoner box and ran after him down the courthouse aisle, shedding the overly-large handcuffs as I ran. Good thing Patril wrists are as big as my thigh. I grabbed the mining blaster from the exhibit table as I dashed by and shoved it in my pants. We both erupted on the empty, dusty Main Street. The Patrils would be just rising to their feet in the courthouse. Not the swiftest of folks, but they sure could operate a mine. The supplies of Gohld had tripled Goodas’ fortunes, and Wilmott had wanted a piece of it. I was certain of that, now. “You’re the embezzler!” I yelled, as I followed him down Main Street, feeling dizzy. The sleep drugs should have left me by now. An odd double-shadow by the general store caught my eye and I remembered that Patrilia was in a binary system. Two suns, two shadows. My brain couldn’t adjust. Wilmott stopped, framing himself perfectly under the clock tower at the end of the street. The clock flashed “12:00” over and over. Must need resetting or, oh duh, got it—the Patrils want it to be permanently high noon. Wilmott smiled, his face shaded twice by his pale, wide-brimmed hat. He drew his gun, twirled it, and re-holstered it. The man must have watched almost as many vids as I had. I hitched up my belt, the blaster having dragged my pants’ crotch almost to my knees, and paused several dozen meters from Wilmott. Now what? Twirling the heavy blaster might give me street cred but I didn’t want to chance spraining a wrist. Dozens of Patrils lumbered out the courthouse door and hunkered on the wooden sidewalks that bordered the street. I knew the Code of the West was about to be played out. Fittingly, a tumbleweed rattled past me in a sudden gritty gust of wind. A watching magenta-hued Patril, all leather coat and spurs, stepped to the side, letting it swoosh past and lodge itself against the saloon wall. “I need a hat to do this right,” I called to the crowd. Stalling was all I could think to do. The same violet-shaded Patril female who had winked at me in the courthouse tossed me a white Stetson. At closer look, her checkered dress was not gingham but some inappropriately-glossy fabric, borderline Taboo. I put the hat on and canted it down over my eyes. Might as well go out in style. “Wilmott, you kill me and Alliance cops will come and get you,” I called. Wilmott twirled his gun twice more and grinned. He was enjoying this. “If the blaster can kill a human, then why aren’t you afraid?” I drew it slowly and pointed it at him. Darned thing was really heavy. It wavered wildly in my hands and the crowd snickered. I braced it with both hands, aimed, and fired. A plume of dust arced out several meters in front and to the left of Wilmott. As I’d suspected, the beam was too wide and too weak to actually kill anyone. “You couldn’t hit a brown door,” he said and chuckled. Annabelle smiled and took a half-step closer to me, swaying her massive hips so hard her handbag knocked against the porch post. The elderly Patril’s response was garbled by the universal translator but I figured I knew curse words when I heard them. The Code of the West that the Patrils currently endorsed was all that remained of a prehistoric survival trait. The extinct reptiles, whose bones were now in such hot demand, had preyed on the ponderously-slow Patrils, hundreds of thousands of years ago. In defence, they had developed a chameleon-like mimicry of which little remained except an urge to copy other cultures as if they were their own. Since the famous incident a hundred years ago, when mimicking the sea slugs of Gliese 581g had caused thousands of Patrils to die in their bathtubs, they had chosen to work their way through the safer human sub-cultures. At least, the Old West scenario wasn’t as bad as the last mimicry they’d done: everyone sporting big puffy hair and shoulder pads, chewing gum, and listening to a type of loud discordant music called “glam rock”. I’d seen a news vid of it, a decade ago. Scary stuff. “Be a gentleman,” I told Wilmott. “Give me a fighting chance. I’m going to prop the laser on the saloon porch and try again. Then it’ll be your turn.” Suiting my actions to my words, I stepped up on the boardwalk, smacked the cumbersome barrel down on the railing, and positioned my feet near the tumbleweed. The nearby Patrils nodded in agreement at my suggestion. They would defend to the death my right to apply the Code of the West. My death, that is. “Just going to scratch my ankle,” I said, carefully casual. “It’s good luck in my Terran sub-sub-sub-culture.” I reached a hand down, keeping my eyes on Wilmott. His hand twitched towards his gun but a rumble from the Patrils closest to him made him replace his hand on his hip. I heard Annabelle’s shiny dress rustle behind me and a piece of soft material touched my hand. The elderly Patril fainted dead away and the other Patrils nearby stirred dangerously. Their reptilian hind-brains were telling them Annabelle’s violation of the Code of the West endangered them all. I knew that the Old West scenario had been around long enough to be thoroughly entrenched in the watching Patrils, especially the older generation. Some exobiologists, in fact, believed the Patrils were overdue for a change to a different sub-culture. I whispered my thanks. An ally in an unlikely place. How like a Western. I grabbed the tumbleweed in my cloth-wrapped hand and lobbed it towards Wilmott. It soared through the air and hit him in the chest. Just like the welcome vid had warned, it spontaneously combusted on impact. Flames burst and he smacked at his chest, dropped, and rolled frantically in the dust. The judge nodded sagely and began tramping back to the courthouse. This must be the point where I ride off into the sunset. I looked around for an ATV. As pseudo-horses, they were kept unlocked and keyed to anyone. A scuffling noise behind me. “Let me go,” Annabelle warbled, an octave or two below middle C. Her arm was in the grip of a deputy with a fake waxed mustache a half-meter wide. “I charge you with violating current mimicry protocol, with Taboo Violation!” he said through mustache hairs that trembled like twigs in a breeze. The crowd gasped. The penalty, I knew from the welcome vid, was death. This planet was over the top. I dashed past the lumbering Patrils to the nearest ATV, hollering for Annabelle to follow. I jumped in the driver’s seat and held on as she wrenched free from the deputy and leaped in beside me. The vehicle rocked but didn’t tip. I barrelled the ATV through the angry mob and out of town. After a few kilometers, my heart rate slowed. One of the suns was just touching the horizon. I’d escaped into the setting sun. And a girl was beside me. Just like in the best vids. I adjusted my Stetson and gave a happy sigh. “Shaken? Not stirred?” She opened her handbag on her satiny lap and drew out an empty martini glass and a lethal-looking handgun: an anachronistic Walther PPK from 1955 Terra. She waved them at me and her laugh shook the ATV like a ball of thunder. I joined in, chuckling and shaking my head. The next fad wasn’t overdue. Annabelle snuggled closer, crushing me against the door and making me swerve all over the road. “Well, my dear, there’s no ‘bond’ strong enough to keep us on this planet any longer.” I spied the spaceport in the distance and aimed the ATV straight toward it.